It’s an out-of-this-world burger experience! 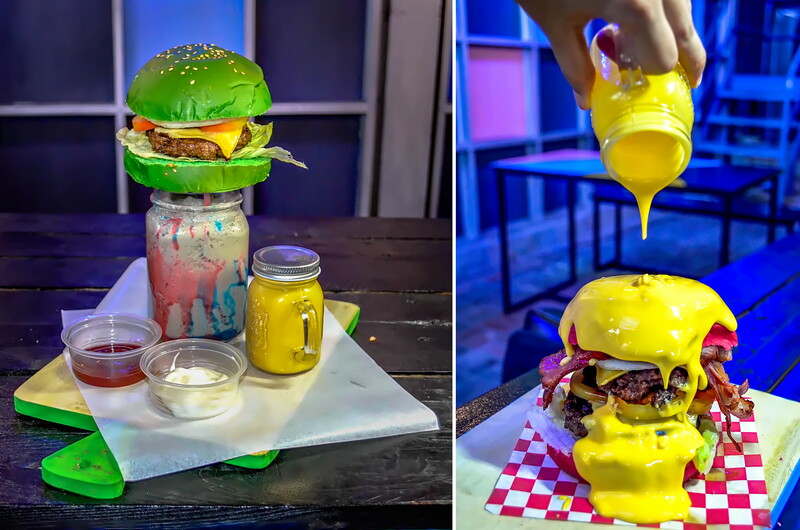 Planet Burger & Grill serves burgers in colorful buns — a visual feast. The burger bursts with beefy goodness. I really love it when burgers with all the toppings, still allow me to savor the rich beefy taste. There are other burgers from other burger joints that keep me guessing where the beef went, but not here. Try the Mercury Blast. It has the yummy burger patty, with bacon, cheese, lettuce, onion and tomatoes. The experience doesn’t end there. You can order their space lava cheese and pour it generously on top of the burger!!! Yes, on top of it. It’s deliciously messy. But I’m not complaining. I’m having loads of gastronomic fun. Would you like frappe to go with your burger? Planet Burger & Grill, in collaboration with Hue Cafe PH, serves caramel frappe topped with a quarter pounder burger, otherwise known as Space Burger Frappe. How about meals with rice? Grilled pork’s just one of my comfort foods. They have that too! Grilled Liempo comes with rice, onions, soy sauce and vinegar sauces.